I just received this article from my older brother via e-mail. The first time I saw this gigantic swimming pool, my eyes were like glued to the computer screen. I was simply amazed. I can't quite describe it's just unbelievable! So, I decided to share this with you all. If you like doing laps in the swimming pool, you might want to stock up the energy drinks before diving into this one. 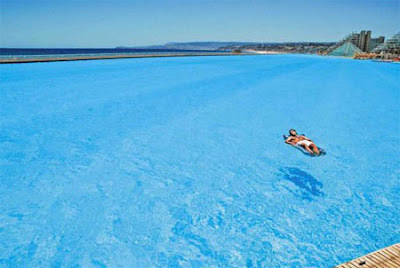 It is more than 1,000 yards long, covers 20 acres, had 115 ft deep end and holds 66 millions gallons of water. 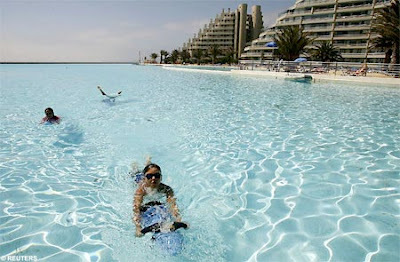 The Guinnes Book of Records named the vast pool beside the sea in Chile as the biggest in the world. 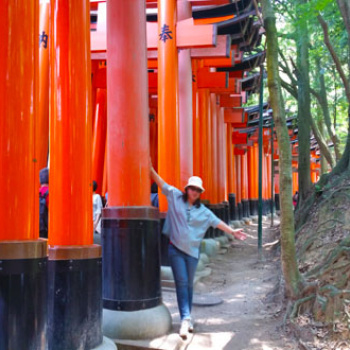 But if you fancy splashing out on one of your own - and you have the space to accommodate it - then beware: This one took five years to build, cost nearly 1 billion and the annual maintenance bill is 2 million. 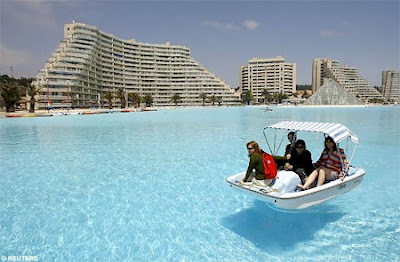 The man-made saltwater lagoon has been atrracting huge crowds to the San Alfonso del Mar resort at Algarrobo, on Chile's souther coast, since it opened. Its turquoise waters are so crystal clear that you can see the bottom even in the deep end. It dwarfs the world's second biggest pool, the Orthlieb - nickname the Big Splash - in Morocco, which is a mere 150 yards long and 100 yards wide. An Olympic size pool measures some 50 yards by 25 yards. 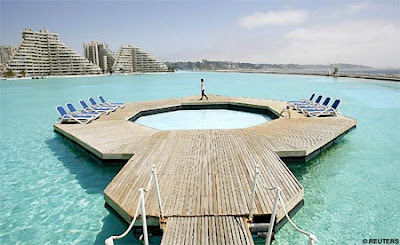 Chile's monster pool uses a computer - controlled suction and filtration system to keep fresh seawater in permanent circulation, drawing it in from the ocean at one end and pumping it out at the other. The sun warms the water to 26c, nine degrees warmer than the adjoining sea. 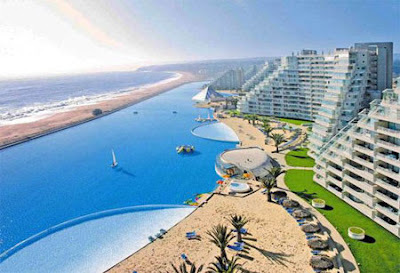 Chilean biochemist Fernando Fischmann, whose Crystal Lagoons Corporation designed the pool, said advanced engineering meant his company could build "an impressive artificial paradise' even in hospitable areas. shocks kelan kya ako makakalangoy jan haha.